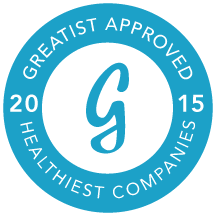 Otter Products was selected as one of the Healthiest Companies to Work For in America by Greatist for 2014 and 2015. Along with Twitter, Google, Zappos and more, Otter Products was recognized for bike friendly facilities and regular involvement in the city’s biannual Bike to Work Day which earned a “silver” business status from the League of American Bicyclist. Another mention was the on-site fitness facility which caters to other forms of exercise with a trainer holding group classes.